ഒരു തുള്ളൻ ചിത്രശലഭമാണ് മലബാർ പുള്ളിപ്പരപ്പൻ ‌ (ഇംഗ്ലീഷ്: Malabar Spotted Flat). Celaenorrhinus ambareesa എന്ന ശാസ്ത്രീയ നാമത്തിൽ അറിയപ്പെടുന്നു. 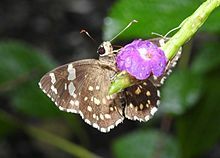 is a butterfly of the hesperiid family found in India. ↑ Plesioneura ambareesa, Moore, P. Z. S., 1865:788. ↑ Evans, W.H. (1932). The Identification of Indian Butterflies (2nd ed.). Mumbai, India: Bombay Natural History Society. p. 324, ser no I11.3. ↑ R.K., Varshney; Smetacek, Peter (2015). A Synoptic Catalogue of the Butterflies of India. New Delhi: Butterfly Research Centre, Bhimtal & Indinov Publishing, New Delhi. p. 34. doi:10.13140/RG.2.1.3966.2164. ISBN 978-81-929826-4-9. ↑ W. H., Evans (1949). A Catalogue of the Hesperiidae from Europe, Asia, and Australia in the British Museum. London: British Museum (Natural History). Department of Entomology. p. 94. വിക്കിമീഡിയ കോമൺസിലെ Celaenorrhinus ambareesa എന്ന വർഗ്ഗത്തിൽ ഇതുമായി ബന്ധപ്പെട്ട കൂടുതൽ പ്രമാണങ്ങൾ ലഭ്യമാണ്. ഈ താൾ അവസാനം തിരുത്തപ്പെട്ടത്: 09:46, 27 മേയ് 2018.